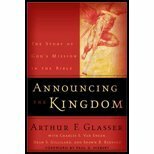 Announcing the Kingdom - The Story of God's Mission in the Bible (03) by Engen, Charles E Van - Gilliland, Dean S - Glasser, Arthur F [Paperback (2003)] est le grand livre que vous voulez. Ce beau livre est créé par NA. En fait, le livre a pages. The Announcing the Kingdom - The Story of God's Mission in the Bible (03) by Engen, Charles E Van - Gilliland, Dean S - Glasser, Arthur F [Paperback (2003)] est libéré par la fabrication de Baker Academic, Paperback(2003). Vous pouvez consulter en ligne avec Announcing the Kingdom - The Story of God's Mission in the Bible (03) by Engen, Charles E Van - Gilliland, Dean S - Glasser, Arthur F [Paperback (2003)] étape facile. Toutefois, si vous désirez garder pour ordinateur portable, vous pouvez Announcing the Kingdom - The Story of God's Mission in the Bible (03) by Engen, Charles E Van - Gilliland, Dean S - Glasser, Arthur F [Paperback (2003)] sauver maintenant.